For some, the task of finding a pair of glasses or sunglasses is an epic task. Not only do you have to find a pair that compliments the shape of your face, but they also have to fit your face. 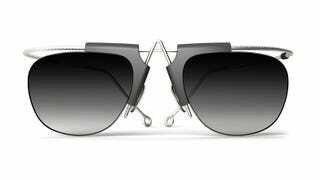 With that in mind, designer Ron Arad designed the A-Frame line of glasses that can expand and contract to sit comfortably on any face address the latter issue. The secret behind these specs are the wire-frame body, which rely on sprung hinges to deliver the magic. The point above the nose is not just to provide a unique look, but also houses the hinge mechanism that allows the lenses to slide in and out when you bend the frames up or down. the hinges on each side of the face also contain the same technology, and when removed from the face, automatically collapse back into their folded position.